I his large, black woodpecker with white neck stripes and a scarlet crest is unmistakable. Its flight is strong and direct. The species occurs mainly in forest but is increasingly found in parkland and wood lots. A liking for insects that bore into dead wood causes it to excavate deep cavities in tree trunks. It is also attracted down to the foot of a tree or a dead trunk to seek carpenter ants, which tunnel into the wood from the ground upward. The hammering made by the feeding birds is a noticeable sound in quiet woodland. 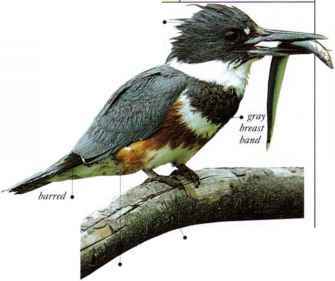 Birds also take-some nuts, acorns, and small wild fruits. The call is a repeated "wuck-a-wuck-a," rising and falling in pitch. In spring, the male also advertises his territory by rapid drumming on a branch. • NKST A hole excavated in a tree trunk (often in a close stand of trees) or in a dead tree stump or a telephone pole. DISTRIBUTION Much of Canada and parts of USA, especially in the east. • REMARK Since the probable-extinction of the Ivory-billed Woodpecker in the middle 20th century, this is now the largest species DISTRIBUTION ? of woodpecker occurring in North America.